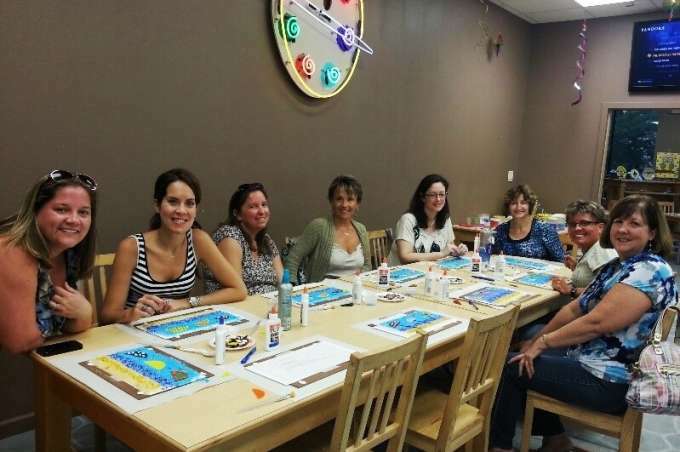 When it comes time to unleash your creative side, Chesapeake has the perfect place for you. GLӓZENFYRE is a contemporary paint-it-yourself studio that offers over 1,000 different pottery items and plenty of canvases as well. No matter what you&apos;re in the mood to paint, they&apos;re sure to have it. They even have glass pieces you can make. "It&apos;s like putting a puzzle together without a picture," says GLӓZENFYRE co-owner Diana Snyder. "Then we put the pieces in the kiln at about 1,600 degrees. At that temperature, everything melts away but the glass." If you&apos;re wondering just how much fun painting can be, take a look at the awards the studio has won. Since opening in 2005, Glazenfyre has won the Best Pottery Studio Gold Award every year. "We&apos;re completely local," says Snyder. "There&apos;s no franchise here, so we take care of our customers differently. In fact, we take full-service to the next level. We bring everything to you-paints, supplies, everything. We&apos;re like your waiters and waitresses. It makes for a more relaxing, creative experience." Spice up your birthday with a GLӓZENFYRE party. Over the rest of the year they offer events nearly every night of the week. Be sure to check their website for this month&apos;s events calendar. Become "part of the art" at GLӓZENFYRE. No matter your age or skill level, there&apos;s something fun for everyone. Stop by today and let the moments begin.